Signups and customers in your Chargebee site will be automatically synced into the configured list in MailChimp. Group and auto segment your signups and customers based on specific criteria such as their plans, addons, sign up dates. Segmentation and groups make it easy to send people content. Target customers purely based on their attributes to invoke better conversions. Apart from Chargebee, do I also need to work with a payment gateway account as well? Yes. You need your own payment gateway account to help process credit card payments & receive money in your bank account. Configure the gateway credentials in Chargebee and you are all set to receive payments. No separate integration is necessary. We can help you get one if you need any assistance. How do I send different newsletters to different set of customers - say basic & premium plans using MailChimp. 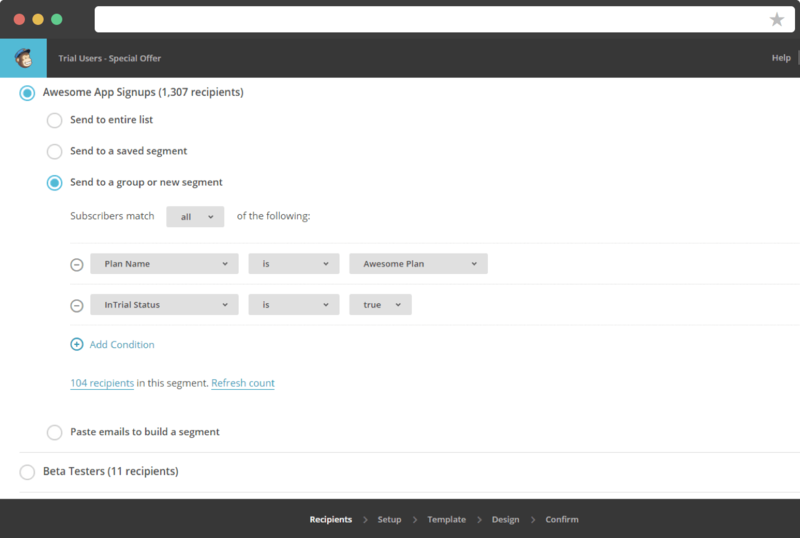 Mailchimp supports a feature called segmentation that allows you to send different emails to customers by using filters.Instead of using multiple lists you can use a single list, filter by specific fields like "PLAN NAME" to segment it. 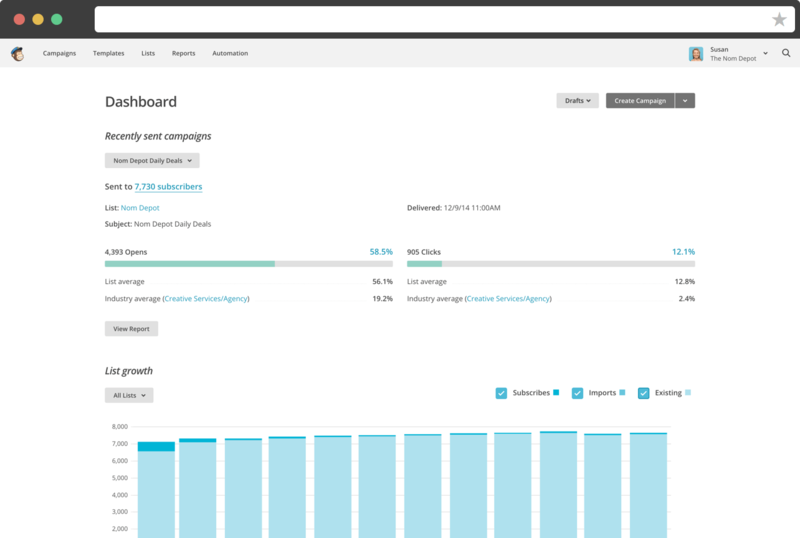 How frequently is MailChimp synchronized by Chargebee? 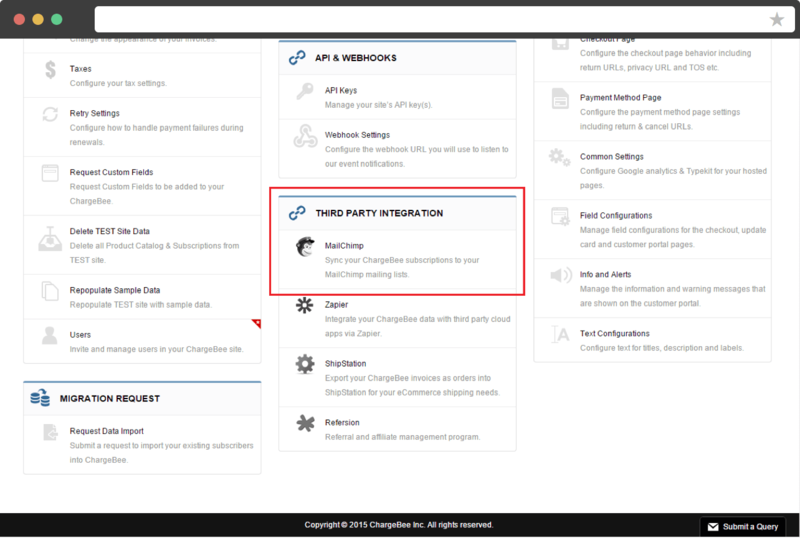 Chargebee automatically syncs with MailChimp at a set interval. If you need to view the latest updates right away, you can use the "Sync Now" option in Chargebee to sync and view the latest data. If a subscription is canceled in Chargebee, is this updated automatically in MailChimp? Yes. You should ideally setup your newsletters to go out only to subscribers having "ACTIVE" status. If a subscription is canceled in Chargebee, the status will be updated automatically & those susbcribers will not receive your newsletter. If a customer directly unsubscribes (cancels) in MailChimp, does the billing stop automatically? No. The data is synchronized from Chargebee to MailChimp and not vice versa. If a subscription is canceled directly in MailChimp, you will still need to cancel it in Chargebee using the admin interface. Does Chargebee automatically send invoices to my customers? Yes. However, you should explicitly enable this under email settings in Chargebee. Is the credit card payment managed securely? Yes. Chargebee is PCI Level 1 certified service provider and all credit card data are handled in a PCI-DSS compliant manner. Can Chargebee help make modifications on my website to integrate? We have development partners who you can choose depending on your budget. The integration is super simple. Depending on the level of customization required they can give you a quote. Does Chargebee work with other service providers like MailChimp? We do have plans to integrate with solutions like Campaign Monitor, aWeber etc., Let us know which solution you are looking for and we will be happy to assist. Can my MailChimp subscribers be imported into Chargebee? We have a standard spreadsheet format in which you can feed in all the subscriber information and we can work from there. Email us at support@chargebee.com if you need any assistance with this.